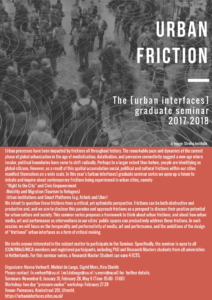 Together with Nanna Verhoeff, Sigrid Merx, and Hira Sheikh, I am organizing this seminar series about Urban Friction. It is part of the research group [urban interfaces] I co-founded with Nanna & Sigrid. We intend to question these frictions from a critical, yet optimistic perspective. Frictions can be both obstructive and productive and, and we aim to disclose this paradox and approach frictions as a prospect to discuss their positive potential for urban culture and society. This seminar series proposes a framework to think about urban frictions, and about how urban media, art and performance as interventions in our cities’ public spaces can productively address these frictions. In each session, we will focus on the temporality and performativity of media, art and performance, and the ambitions of the design of “frictional” urban interfaces as a form of critical making. This seminar is designed around shared reading, discussions, and also some hands-on experimentation during a two-day “pressure cooker workshop.” Here you find the reading list with materials about urban frictions, issues of participatory city-making, and urban interventions. The program for the workshop on February 27-28 2018 will follow. Through these readings we will introduce and discuss some fundamental theoretical questions that have formed and challenged urban frictions through the three central frameworks of the seminar: 1) frictions in participatory culture, 2) urban publicness and civic city-making, and 3) urban interventions and the critical making of urban interfaces.